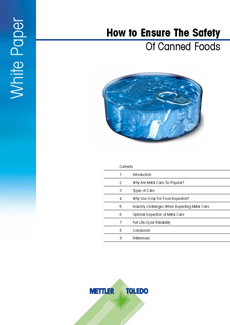 This white paper explores the challenges that metal cans and their design presents for x-ray inspection systems. It explains why metal cans are becoming increasingly popular and looks at different types of cans. In addition it looks at the various x-ray inspection systems on the market today including recent developments to provide optimal inspection of metal cans. Metal cans are used extensively across the food industry to package various products such as meat, fish/seafood, fruit and vegetables, soups and infant feeding products, mainly milk powder. However, inspecting metal cans for physical contaminants and quality defects using x-ray inspection systems have traditionally proved challenging. Why Are Metal Cans So Popular? Why Use X-ray For Food Inspection? Increasing regulatory and consumer demands have intensified the pressure on the food and beverage industry to implement reliable methods of inspection to ensure product safety and integrity. Despite the challenges metal cans have traditionally posed for x-ray inspection, innovations in technology mean solutions are now available which are capable of ensuring the utmost safety and consistent quality of a wide variety of products packaged in metal cans. This is good news for food and beverage manufacturers looking to stay ahead in the booming global canned food market. The X37 Series of food x-ray inspection systems is ideal for the inspection of food packaged in tall, rigid containers such as metal cans and glass containers. Contamination detection, fill level measurement and pack integrity checks using two angled horizontal x-ray beams at high speeds.